I use to grow broccoli in my garden, but oh my, dealing with the worms was such a headache. I would bring in the broccoli heads and then soak them in salty water to kill all of them and then hope I didn’t find a dead one in my cooking. So, now I prefer to buy my broccoli and cauliflower at our neighborhood farmers market. So fresh!! My mom would fix this so much during the summer time and when I use to go to her house for lunch while I worked close to them, it was always so good with a sandwich. I loved going to my parents home for lunch and visiting with my dad while we ate lunch and then walking next door to my mom’s beauty shop and visiting with all the lovely ladies she worked on. When I left for my new job in another town, I really missed those lunch hours with them. Mix all the salad ingredients in a bowl. Whisk together well all the dressing ingredients. Pour dressing over salad, mix well and let stand in the fridge till cool. The recipe calls for bacon bits, but I have used bacon that I have cooked myself. It does seem to give it more flavor. This looks like something my extended family would love this! Piinning. I love this salad!! I eat it whenever I see it, but have never made it myself!! Thanks! This looks so good. I love side dishes like this which aren’t heated up. And they last a few days in the fridge too. I will have to try it. Take care and have a good week. One of my favs and just so refreshing with summer dishes. Thanks for stopping by. This salad looks so good! Thanks for the recipe! 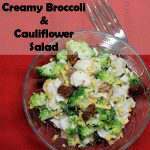 I love broccoli salad…I usually buy it -Now that I know how easy it is, I will make it! Pinned for later! Woo hoo! Thanks Meeghan for stopping by. This is one of my favs and so good with everything we eat in the summer time. We have this at almost every family get together. 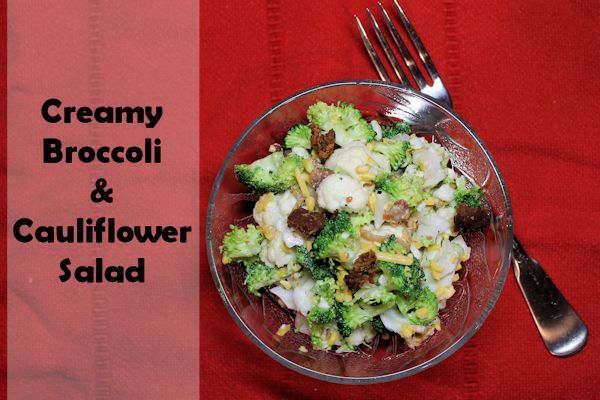 I love broccoli an cauliflower salad! I love salads like this in the summer. Pinned to Creative K Kids Tasty Tuesday Board. Thanks for pinning up with us this week.